Good morning, Oh She Glows readers! 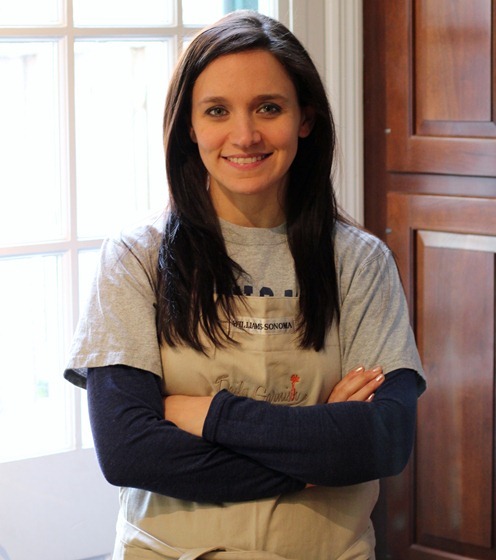 I’m Emily from Daily Garnish, and I’m thrilled to be guest posting on one of my favorite blogs this morning. My husband and I have both been vegetarians for about three years now, and more recently we’ve been eating a mostly vegan diet. In just a few years of meatless eating, we have both found ourselves to look better, feel better, and simply live better each day. In 2009 I quit my job in fundraising to go to culinary school and follow a dream, and now I do recipe development and writing as a full time job. It’s pretty exciting! Our latest creation is a baby boy, due this coming October! I’ve found that pregnancy has only intensified my passion for healthy, meatless eating, and I’m looking forward to spoiling our little guy with delicious vegan treats. Today I’m happy to share with you a few of my personal favorite vegan recipes – everything from appetizers to soups to baked goods. A little something for everyone. Enjoy! These are my favorites of all the muffins I’ve made, and what’s great is that you can customize them with whatever fillings you want – different jellies, nut butters, and more! This is one of my all-time favorite recipes, and one that we make over and over again at my house. Non-vegans will never know that this isn’t a real mushroom cream sauce! You really can’t go wrong with mashed potatoes and gravy. Am I right? The caramelized onions take this to a whole new level – a Thanksgiving favorite at our house! Soup is my favorite thing in the world, and there is something just so comfortable about a creamy chowder. This lightened vegan version of corn chowder has quinoa and beans for a protein punch. Tastes rich but is actually ridiculously healthy – my favorite kind of food! This is a great thing to make if you’re headed to a party and you’re worried that there might not be any vegan options available for you. Vegans and non-vegans have both raved about this healthified version of a classic appetizer. Many thanks to Angela for the opportunity to talk with you guys today. You can find plenty more recipes, and occasional baby talk over at Daily Garnish. Stop over and say hi! I love Daily Garnish! All of the guest posts have been amazing – it’s awesome to have 5 delicious looking vegan options right in one post! 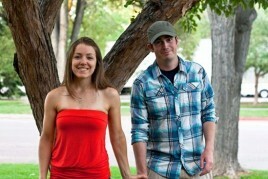 Aw, love seeing one of my very favorite bloggers featured on another very favorite blog! Emily, you know I’m president of the Daily Garnish Vegan Recipes club! :) All looks fabulous! I made the Vegan Mushroom Sauce and Spaghetti Squash awhile back and it was soooo good! 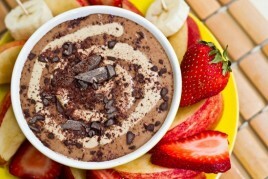 I think I will need to be making this again soon after seeing it :D YUM! I looked at the picture of the gravy, and I swear my jaw dropped. Uh….yum. mashed potatoes + gravy sounds and looks fantastic. It’s the best when I see my favorite bloggers come together on the same page :D Great pictures Emily! I’ve actually already tried your chowder and muffins. Both were delicious! Completely agree. 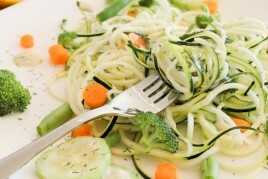 Daily Garnish and Love Veggies and Yoga just days apart….and Oh She Glows – my top 3 blogs in one place. Gotta love it! Im glad you are enjoying the posts! Those strawberry muffins look incredible. 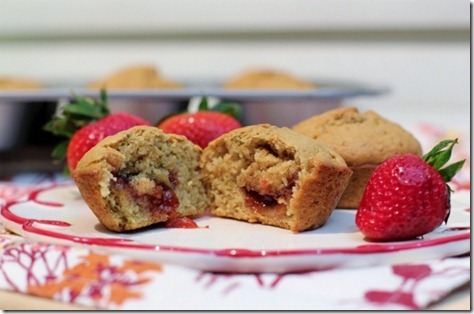 Yumm I’m gonna try the muffins, love that I can change the fillings. Great guest post! That spinach dip looks AWESOME!! My roomies would love it! Aww, I love this post! You have a beautiful smile, by the way. The mushroom dish sounds AND looks amazing!! I cannot wait to make it. This is my first time reading your blog so thank you for writing this guest post. Great collection of recipes. Thank you! :) So nice! Emily your recipes are awesome. I am RACING over to check your spinach and artichoke dip next!! And thanks again, Angela, for having me guestie on your site yesterday. It was awesome and I’ve already “met” some new readers. Yey! :) Two awesome blogs combine for an afternoon! ALL of these look fabulous! But especially the muffins and the mushroom sauce….I love creamy vegan sauces!!! That spinach artichoke dip looks divine — definitely trying that! PS, I have now happened across your blog twice and have enjoyed myself each time, so with that, into the Google reader you go!! Love your recipes. I am getting hungry just looking at the pictures! Great post! Oh my gosh, that soup looks so delicious! I’ll have to bookmark that for fall! Mashed potatoes + gravy is my number one favorite comfort food (well, maybe its a tie with mac & cheese/yease). I could live on soup in the fall & winter and am always looking formore recipes that use quinoa. Spin-art dip is my favorite appetizer. I am RACING over to bookmark your blog. 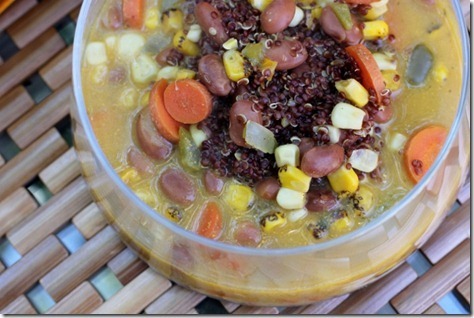 I made the quinoa and bean corn chowder awhile back and loved it! Can’t wait to try some of the others! All of these sound wonderful! Yum! 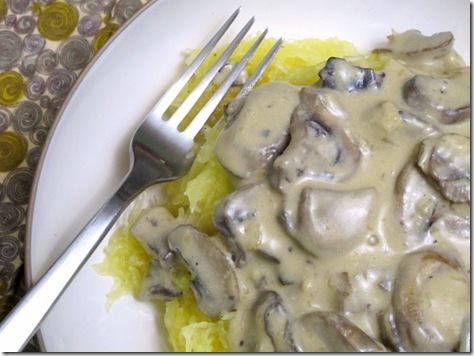 Ooooh, the spaghetti squash with creamy mushroom sauce sounds amazing! Always love your recipes Emily! 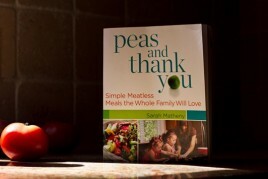 So many new delicious recipes, thanks for sharing as a guest post! Creamy mushroom sauces are my guilty pleasure. Your recipe looks delicious! 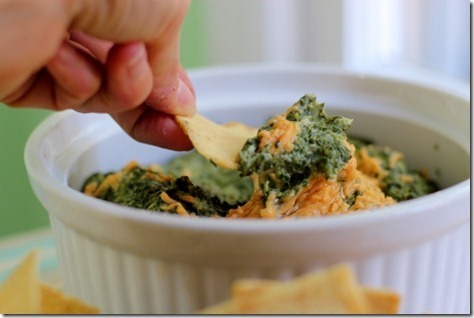 the spinach dip looks great–my wheels are turning for a raw version. great guest post, really enjoyed it. Oh my. That Spinach dip looks incredible. I am a potato girl. I can’t wait to try that mashed potato & gravy recipe. I can only imagine how good the onions make it! Quinoa is magical. There, I said it! ;) Wonderful recipe. your mashed potatoes look amazing! I can not wait to try these! Thank you for sharing! The mushroom cream sauce and spinach artichoke dip look amazing! And the best part is that I have most of the ingredients on hand already!! The men in my life are already getting geared up for the upcoming football season, and I hope to make the artichoke dip for a sunday of lounging and football! Thanks! 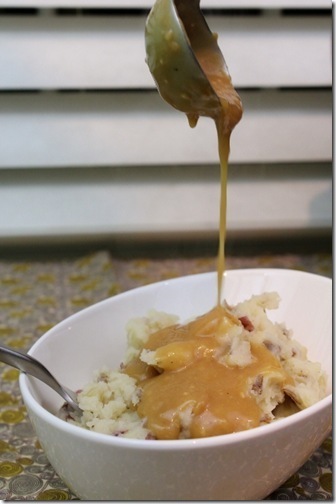 Mashed potatoes and gravy – looks SOOO good! That spinach artichoke dip is calling my name! All of those recipes looks so good! I’m dying to try the spinach artichoke dip. It’s one of my favorites at parties, but I almost never eat it because i can’t stand mayonnaise and usually it’s in the recipe. I can’t wait to try this! I love Emily’s Quinoa and Bean Corn Chowder. It’s one of my favorite recipes! a lot of these seem really heavy for summer. but maybe in winter I would try some. I definitely need to start adding caramelized onions to my mashed taters!!! I bet the flavor is out of this world! The creamy mushroom sauce looks awesome, I will definitely give that one a go! I <3 the spinach and artichoke recipe! I’m not a vegetarian, but these recipes could convert me! I haven’t read Emily’s blog, but will be checking it out asap! Those look great! Can’t wait to give them a try. Thanks for sharing them! Can’t wait to try the spinach artichoke dip. I love it and hate that the regular version is so unhealthy! I am not vegetarian, let alone being vegan…but these look like they would make any meat-lover start salvating! HAHA Excellent post! I made that spaghetti squash dish with the mushroom sauce today, it was so good!